Katalin Erdélyi. Photo courtesy of Marietta Le. Used with permission. 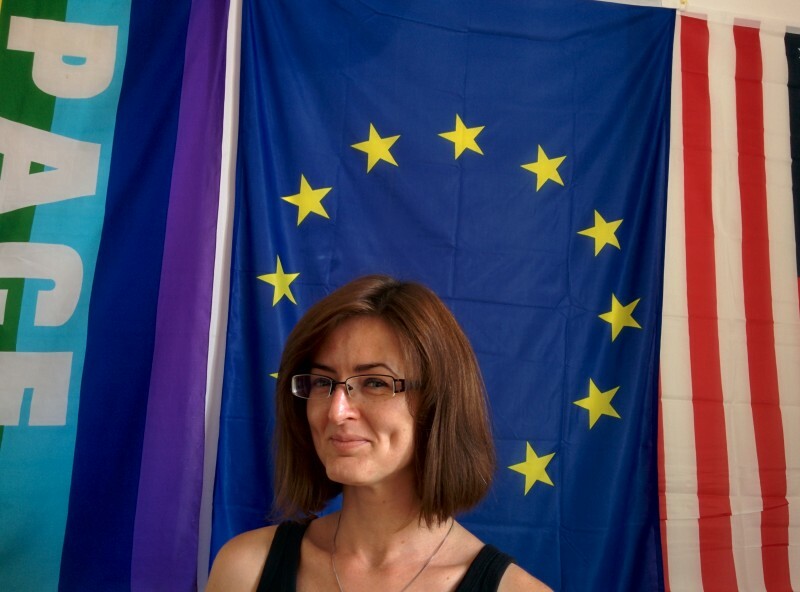 Katalin Erdélyi is a Hungarian blogger, journalist, and activist. She led a fairly normal life, until she and her activist group became nationally famous earlier this month for launching a crowdfunding effort against the government’s anti-immigrant billboard campaign . The state's campaign is part of the “National Consultation on Immigration and Terrorism,” based on the results of an allegedly biased survey . The Hungarian government is spending 300 million  forints (1 million USD) on a follow-up campaign. Within days, tens of thousands of dollars came pouring in for the counter-campaign. Some critics of the government's new effort have even begun tearing down  or painting over  the billboard signs promoting anti-immigrant messages. Social networks are flooded by photographs of billboard templates with altered texts, and a Hungarian news site ran a competition  for the funniest. Many people, moreover, have started donating money to the counter-campaign run by Erdélyi's Vastagbőr  blog and the Hungarian Two-Tailed Dog Party  (a party which was originally just a joke). Global Voices spoke to Erdélyi in Budapest about the counter-campaign, public sentiment on immigration in Hungary, and her organization's crowdfunding effort. Global Voices (GV): As of June 12, 9 am, four days  into the two-week crowdsourcing campaign,how much money do you have in your bank account at the moment? GV: That’s quite a lot for an activist and journalist from Eastern Europe. How did that money get there? GV: Is it legal to receive that amount of money on your bank account? Isn’t the Hungarian Tax Authority after you? GV: What will you spend the money on and what is the purpose of your campaign? GV: Why do you have to send messages to the government on billboards? That seems like an odd way to do it. GV: For those who are not familiar with the situation in Hungary, can you explain what the government’s anti-immigrant campaign is about? GV: What do the statistics say and do Hungarian people feel that Hungary is “overflown with immigrants”? KE: According to the statistics, Hungary is not overflown with immigrants. In the first place, many refugees who arrive to Hungary aim to get to western Europe. The other part of the problem is that the Hungarian government spends  more money on this campaign than on the provision for refugees arriving to Hungary. This makes no sense at all. GV: Who is the target audience of the government’s campaign? Someone like you? GV: Who is the target audience of your counter campaign? A Hungarian Two-Tailed Dog Party message using similar design to the official “National Consultation” billboards. Picture posted by Vastagbőr blog. GV: Who is wiring the money, do you have any information about them? GV: How does this all work? What would I have to do if I wanted to support your campaign? GV: Do I have to add a message in the payment details? GV: You mentioned you are keeping record of the crowdfunding in an Excel sheet and in you asked for help from your followers and friends on Facebook in doing this post on Facebook. Have people volunteered to help? KE: I’m not ashamed of this, I’m a journalist and mathematics were never my strength. I know how to use [Excel] at a beginner level and that’s it. At the start of the campaign, I promised to keep the books in a public Google Spreadsheet , anonymizing the names to initials with each row showing a donation from someone. We thought that during the two weeks of our campaign we will reach our goal of 3 million forints (about 10,700 USD). We didn’t expect that it would be surpassed in a couple of hours. When I was there with a dataset of thousands of rows, then I thought I would ask for help. Our readers were super helpful, they helped with Excel, sent us functions, templates for the task. And the latest is a developer who wrote a macro which really makes it possible to update the donation spreadsheet in two seconds. GV: There have been quite a few Facebook posts in the past few days praising the success of your crowdsourcing campaign and discussing how civil society organizations have been struggling with crowdfunding and fundraising in general lately. When you hear that more than 100,000 USD has been raised so far, you wonder what the secret is. GV: I know you’re not allowed to give us the details of the planned campaign, but is there any chance you could leak a bit of information? GV: Has the government provided any response to the counter-campaign? GV: You said that the Hungarian Two-Tailed Dog Party is a co-organizer in the campaign. When did what was originally only a “mock party” become a political actor in Hungary? GV: Do you think the campaign is any help to immigrants and refugees who are already living in Hungary? GV: What has the effect of the “government propaganda” been? GV: Atlatszo, the investigative journalism site where you work, has received an award for digital activism from the Index on Censorship in 2015. Are you a journalist or an activist? GV: Are you a member of the Hungarian Two-Tailed Dog Party? Disclaimer: GV author Marietta Le is a contributor to Atlatszo.hu .